Jonathan Trumbull Howe was born on 24 August 1935. 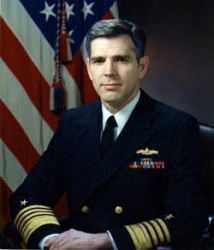 Howe's Naval commands include the USS Berkeley (DDG-15) (1974-1975), Destroyer Squadron 31 (1977-1978), and Cruiser-Destroyer Group Three (1984-1986). His other assignments include Military Assistant to the Assistant to the President for National Security Affairs (1969-1974), Assistant to the Vice President for National Security Affairs (1975-1977), Chief of Staff of the Seventh Fleet in Yokosuka, Japan (1978-1980), Senior Military Assistant to the Deputy Secretary of Defense from 1981 to 1982, Director of the State Department's Bureau of Political-Military Affairs from 1982 to 1984, Deputy Chairman, NATO Military Committee, Brussels, Belgium (1986-1987), Assistant to the Chairman of the Joint Chiefs of Staff (1987-1989). From May 1989 he served simultaneously as Commander in Chief, Allied Forces Southern Europe and Commander, U.S. Naval Forces Europe. Following that assignment, he was named Deputy Assistant to the President for National Security Affairs by President George H. W. Bush in 1991, succeeding Robert M. Gates when he moved on to become CIA director. He is a retired four-star Admiral, and was the Special Representative for Somalia to United Nations Secretary-General Boutros Boutros-Ghali from 9 March 1993, succeeding Ismat Kittani from Iraq, until his resignation in February 1994. Howe was also the former Deputy National Security Advisor in the first Bush Administration. He currently is Executive Director of The Arthur Vining Davis Foundations. Howe is a 1957 graduate of the U.S. Naval Academy, and earned M.A., M.A.L.D. (Master of Arts in Law and Diplomacy), and Ph.D. degrees from the Fletcher School of Law and Diplomacy at Tufts University from 1968-1969. He retired from the U.S. Navy in 1992. On 13 January 1993 after retirement, he received the National Security Medal. He is author of the 1971 book Multicrises: Seapower and Global Politics in the Missile Age. Admiral Howe is married to Dr. Harriet Mangrum Howe, whom he met in high school; her father, Richard C. Mangrum, was a U.S. Marine Corps General and served as Assistant Commandant of the Marine Corps and his father, Hamilton W. Howe, was a Navy Admiral. She is currently an Assistant Professor of Sociology at the University of North Florida. They have six grown children, and currently reside in Florida.